Grandma J is on a major road trip and vacationing in Southern California. She has all but deserted her blog and loyal blogging friends and lurkers. Can you guess why? 1. She's like super busy with her grandkids splashing in the surf in 80 degree weather. 3. She joined a bunch of Hari Krishna's and she's banging her tamborine at LAX. 4. Are you kidding me? She's still in Laughlin trying to win a jackpot at Harrah's. 6. She met up with an unsavory character who took her breath away. 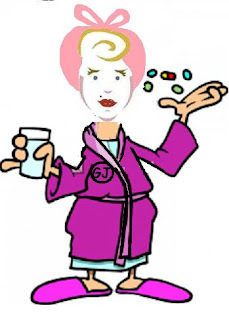 So do you think you know what's happened to Grandma J...or is she just a flake? Well, let's just say she's doing plenty of this....which means #6 is the closest answer! And these guys are hanging around outside her bedroom window!!! How come Grandma J can spend two and a half years in Texas and suffer nothing more than a little heat exhaustion in the summer and frost nip in the winter? Dang, I was hoping for #2 - one that was rich enough to take us all in! Hope you feel better soon!! OH no! I can't believe this sickness found you in sunny California! I was totally routing for the rich man.... Rich would be so nice for a while! I will tell kaish you are sick in the morning and we will pray before school. Oh no! I was hopin' for #1! Rats, GJ. So sorry to hear you're under the weather. I hope you're being taken good care of by Pooper, Beauty, Little One (and their parents). Feel better soon! I vote for 2 and 4! I'm thinking it is All of the Above. And in that case, who knows *what* PJB and Crusty are up to. I was totally hoping for the unsavory character one...I can just see you being all unsavory with an unsavory character (whatever that means!) but I'm sorry that these are the types of unsavory characters you're dealing with. NO fun. Get well soon. I just knew for sure it was going to be #1. I hate that you are sick on vacation...I do hope you get better real soon so you can carry on with the fun! Oh NO!!! the same thing happened to me.... but the miracle drug Dr. M saved me from a complete breakdown.... feel better soon!!!! The change in climate did ya in...get better fast so you can get back to doing #1 on your list! Oh, pooh. I was going with answer #2 - that you would then turn into a blockbuster Harlequin Romance! 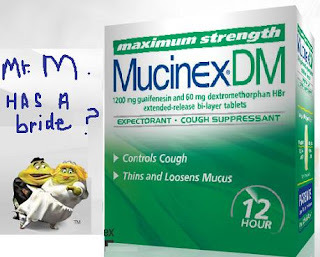 oh geez I was going to guess #6 but not the mucinex man. Get ye a neti pot, twill help you a lot!!! No, it doesn't hurt. Yes, it does wash out lots of yukky crap up there all the better to help breathing. Walmart or Walgreens, thought you'd never ask. 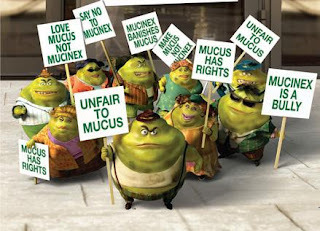 it seems sickness can cross state lines... just like illegal aliens it just hops the borders!!.... get better grandma j! #2's better than a bug any day! Oh,no! Get well soon, maybe you'll have to extend your stay!! You're retired, you can do that you know. Aw, SHOOT! Number 2 sounds like a whole lot more fun;) Hope you will feel better soon!!! OH Man! I just KNEW you had a hottie on the side and were living it up on his yacht in the Mediterranean! It's just me hoping you're OK and wondering if I can bring you some chicken soup or crackers or something. Cooties stinks GJ! Hope you are feeling better soon. Come to VA for Oyster Fest! It's a Cure all! Pinky Promise! Grandma J - hope you are feeling better and out enjoying the grandkids. We're all worried about you -- let us know how you are doing. Kim -- if you're reading, please post how your mom is. Hope you are feeling better soon for your trip to Tucson. I'm out of there, so I don't need to worry about catching anything from you. BTW the weather there was awesome as always. hope you are feeling better! I felt like I hadn't 'checked in' but neither have you! Soak up the love in Cali!